In a high pasture in northernmost New Hampshire I stood next to a farmer looking out on mountains for as far as we could see, mountains that were blue shadows in the distance, and beyond that, grey shadows. This was an exalted view. Seeing it in this moment made me happy; but seeing this every day from the time you could first see would shape you in ways you might not be able to express. This farmer loved this land. A big hydroelectric power project was pushing down from Canada headed south to busy towns and cities and they wanted to go right across his land and his neighbors with high-voltage transmission towers as tall as a fourteen- story building. “All I ask for,” he told me, is “just to get by and hold on to this property that’s been in the family… There’s a lot of history here. You start wrecking it and the history goes with the wreckage.” And when the big company kept coming back and back offering him more and more money—money that he, a dairy farmer, could have used—he told them, “My roots are deeper than your pockets.” He said no to four million dollars. Some of his neighbors were less sure; some, like his cousins next door, sold out for much less. Old friendships were destroyed. This book began in that pasture and it began at a kitchen table in a small Massachusetts town as a man, an engineer who studies ocean acoustics, read to me from his daughter’s ninth grade civics notebook all about how in a democracy “the people hold sovereign power” and how “the will of the people translates directly into public policy.” That is “the definition of a democracy.” His daughter had brought her notes to him and asked: Dad is this true? Is this the way America works? Because it wasn’t working that way around her house. One morning her father had walked out the door on his way to work and found a man standing in his driveway who had big news: a major interstate pipeline carrying natural gas more than a hundred miles from Pennsylvania is going to cross your land and tear up that place where you play soccer with your kids and fly kites. It will sit just two hundred feet from your house. He had a big map and legal forms to be signed. His message was blunt: this is going to happen. We are coming for your land and by law we can take it from you. This wasn’t what they were teaching in civics class at Bishop Guertin High School. And this book began in a large meeting hall with rows of tables covered in big floppy property maps, and company men and women standing behind the tables with a well-rehearsed neutral stare and a practiced friendliness. They were representing the company that wanted to build the natural gas pipeline. They wore bright blue shirts, crisp with the folds from the box they had arrived in, and their name tags hung down on red lanyards. The civilians entered the room and tried to find out if their land was somewhere on those maps. The company had all the information, and again the message was blunt: this is going to happen. The route may change here or there, but we are your new neighbors. The deal is done, they implied. We’ve sold you this car. We can negotiate about the options and the down payment, but the deal is done. This, too, wasn’t the way things were supposed to work if you followed the ninth grader’s civics notes. I sought out these confrontations. They were painful to see and to report. Two different lines had been drawn hundreds of miles across the land by two different companies and what followed was the usual collision of technical information and claims that they were acting in the public interest. The debate moved over many different circuits simultaneously: Was the gas or electricity really needed? What assumptions lay behind the projected need? And above all: who gets to decide? I was especially interested in the emotional toll these projects took. These projects got under the skin. This was about more than kilowatts, power lines, and pipelines. Something in this upheaval felt familiar. I began to realize that I was witnessing an essential American experience: the world turned upside down. And it all turned on one word: property. American property, as we shall see, is always in motion. The world spins; the land under our feet is set spinning by what the law has decided, case by case, over hundreds of years, to be the “highest and best use” of property. The law favors active use and big plans. That deed you may hold is subject to further negotiation by parties unknown to you; it’s subject to being called in, even nullified. The “quiet citizen must keep out of the way of the exuberantly active one,” is how it was defined in the nineteenth century. Development has the right-of-way. And yet property is our anchor and our North Star. We take it as a certainty. It’s our liberty, our pursuit of happiness, as the nation’s founders said. The battles going on around the country today about where to build pipelines, transmission towers, and windmill farms show that our rock-solid certainty is uncertain. That’s part of the anguish in each conflict. The stories in this book are about our belief in property and the cost of that belief. That New Hampshire farmer with his deep roots is part of the story, as is that one Massachusetts family defending their two acres. In other chapters we’ll walk the borderlands of the Sonoran Desert, see New Hampshire’s White Mountains when they were a clear-cut and smoldering ruin, uncover the buried history of an interstate highway that crushed a Vermont farmer, and visit a very small island off the coast of Maine to try and face the rising seas brought on by the changing climate. Our haste to unsettle the world has led to a warming planet. This is the cost of our property faith, one which we have yet to tally. 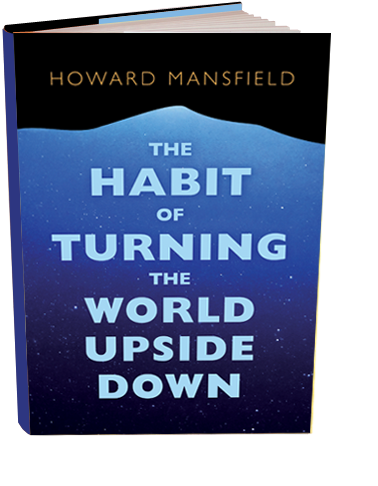 Our heritage, as Tocqueville observed, is one of “turning things upside down.” This book presents just a few stories of Americans living in a time in which everything is in motion, in which the world will be turned upside down, again and again.